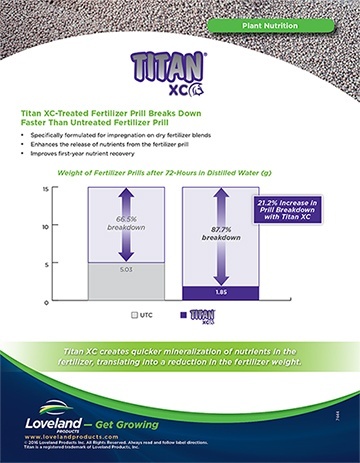 An innovative fertilizer biocatalyst specifically formulated for use with dry fertilizers, Titan XC is the key to quick release and uptake of vital plant nutrients. The unique and concentrated biochemistry in Titan XC enhances the breakdown of fertilizer granules to maximize the return on your dry fertilizer investment. See how Titan XC speeds the breakdown of dry fertilizers in this study.